The Tusi Sites are three examples of the Tusi system in which inheritance of official positions was granted to tribal leaders in ethnic minority regions. The practice was used in China’s feudal period between the 13th and 20th century. 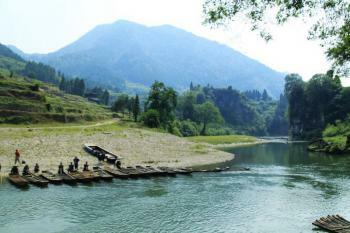 Laosicheng Site, Hailongtun Site and Tang Ya Tusi Site are located in mountainous regions in southwest China. They are also testimony to the traditional cultures and cultural practices of the Tujia, Gelao and Miao Ethnic Peoples. Originally the Tentative Site included a fourth location, Rongmei Tusi Site, but it was left out of the final nomination. The system was abolished in 1953, when the People's Republic of China established the Xishuangbanna Dai Autonomous Region. Tusi Sites are the very surprising nomination for me and when I heard these sites have been inscribed as World Heritage Site, I was laughing out loud for the memories of my visit to Laosicheng village. In December 2011, my friends and I joined the tour group of Europeans and oversea Chinese to visit Xiangxi Tujia and Miao Autonomous Prefecture in Hunan. After 3 and a half amazing days in Zhangjiajie – Wulingyuan National Park and Tianmenshan National Park, our group continued our journey to the heartland of Xiangxi. After 3 blessed clear sky days we started to have problem with weather, when our mini coach left Zhangjiajie, it was heavy rain and snow. The driver drove very slowly along the small road for safety which we were really appreciated. I really did not know exactly what we were going since in the itinerary only stated that “visit Tujia old fortress”. We were already very behind the schedule when we reached the city of Yongshun. Our local guide almost decided to cut the program so that we can reached our final destination, Fenghuang, before 9 PM, but three out of nine tour members (not me) insisted that we should go to see the fortress, and the driver confirmed that if we can finish the sightseeing quickly, he will agree to take us there. I actually was in the camp that preferred to cut the program since I was not sure for night time safety as the guide told me that the whole road will be really small and full of trucks. Thinking back again I was in debt for those guys who insisted to go. The road to the fortress was quite small and full with hairpins, but, thanked to clear sky after rain, the view of surrounding mountain was just lovely. We finally reached the small village, our mini coach parked at the end of the road. Our guide told us that because of short time, we only allowed to see the fortress from the opposite side of the river, taking photo and back! Since the pathway to the riverbank was quite steep, some of the tour members refused to go down and waited inside the mini coach. I almost decided to be in the coach, but my friends insisted me to go and took a photo for them! When I reached the river bank, I did not see any structure that looked like a fortress, my eyes only saw a nice view of small rice terraces with few old shelters, and some small village far behind. Our guide enlightened us that those rice terraces were once the big fortress of Tujia people, we were quite disappointed that the site turned out to be something different from our imagination. One of tour member compared it to Machu Picchu, but I was not sure that I could agree with him! We finished our time at the fortress quicker than driver’s original thought. The visit became a big joke for us for the rest of the trip especially after we arrived in Fenghuang almost midnight. Later I found out that that ruins fortress or rice terrace is one of the three sites of the nomination after read the ICOMOS report. It seems to me that the site actually is more interesting than I experienced, there are tombs, shrines, and pavilions to see. However back in the year 2011, I was not sure that even we have time to cross the river, there will be anything to see for casual tourists like us, as all the historical evidence were under the rice paddies except some old wooden pavilions. 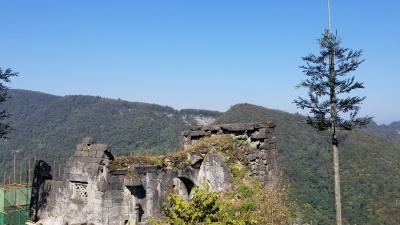 Anyway visiting Laosicheng is truly worthwhile because the place was in the middle of two great sights of China, Zhangjiajie-Wulingyuan-Tianmenshan National Parks and the tentative listed city of Fenghuang, a really wonderful region to explore. Since I don’t have a proper photo of Laosicheng without my friends’ face, I borrowed this one from one Chinese website that closely similar the view that I saw that time. Reduced from broader TWHS: Used to include a 4th location: Rongmei Tusi Site: N 29°56'16.4" , E 110°04'27.5"